My First Run at AFC's Eat & Run! If you follow me on social networks, you probably noticed the great amount of time I spend on the gym or just basically working out. I wasn't really much into gym -- or anything physical activities before but because I'm getting married, I had to exert extra effort to achieve that bridal figure (along with the fiance who has been working out over a year ago). 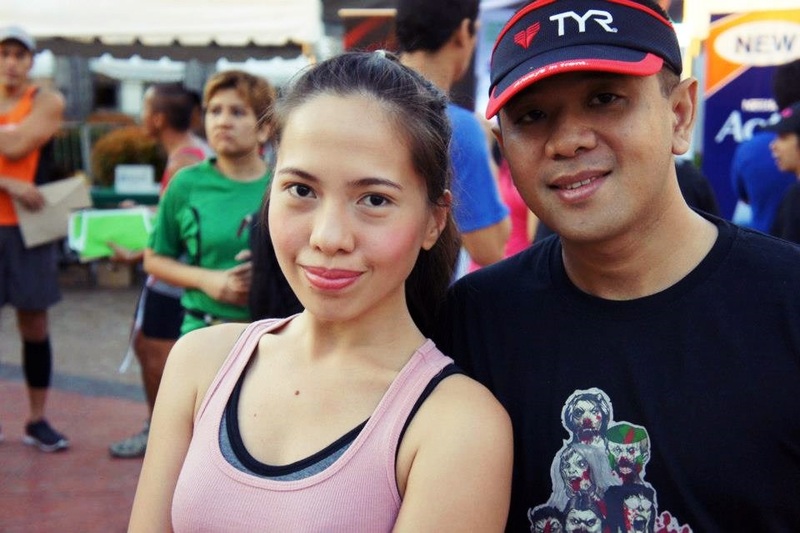 Because of that, Paolo and I have been leaning towards doing activities that will help us physically fit, and one that we have been contemplating about is running. I have been wanting to join runs however, Paolo is a bit weary for he doesn't have that much cardiovascular training (cause he's more into lifting weights) so he'd rather skip running events. Luckily for me, the runner/blogger/ Mr. 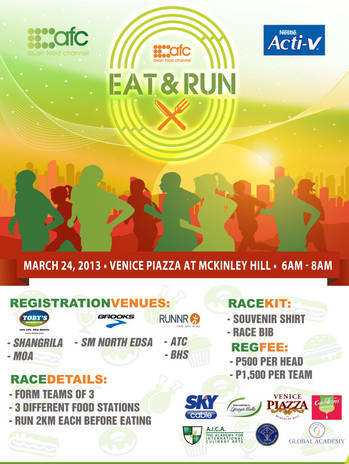 Franc Ramon gave me passes for AFC's Eat and Run Event (which happened last Sunday) that gave me a chance to FINALLY try running and FINALLY convince my fiance in joining a running event. I am so grateful for Franc cause he gave me not just running kits to the event, but also gave me a chance to try out running (becauseI always feared that I cannot survive something strenous like this). What's more interesting is my first ever run event composed of having to eat and run in relay with 2 friends. So I happily convinced Paolo along with our friend, David to wake up extra early (like 5 AM) join us in a super interesting run - then - eat - then - relay activity. I tell you, it was really fun! Paolo, David and I minutes before the run -- had to grab a light and quick breakfast so as to not die from hunger. Why are we wearing a bib? Well it served as a "baton" for us to pass to the next runner after we finish our 2km run + eat. We had a little stretching before the run began at 6:45 AM. When the run started, runners 2 and 3 have to wait here until we're notified that runner 1 has finished his run and food. Took this photo after my 2km run! Haggard lang. Paolo had to finish the food before we can all run together to the actual finish line. Which we did, however we wish we have an actual "running" photo. Oh well. But, the better part is -- when we were about to go home (after getting the loot bag and finsihing the warm down), my bib number was called and won at the raffle! and won cute items from Global Academy! Woot Woot! Glad you enjoyed your first fun run!!! More to come!!! I've never gone to events like fun run. T.T I have to say the "eat" part of the event was unique though.. First time kong marining na funrun sabay kakain :)) Kulit lang. interesting concept for a marathon! :D gusto ko rin sumali for the longest time but i cant make my friends join! it's a nice thing to run and meet some friends in the same time. I miss joining running events. wow, good for you! I wish I can run too but it's too taxing and stressful for me. Maybe in time, I can do this too like you. I need to have my motivation. Hehehe.